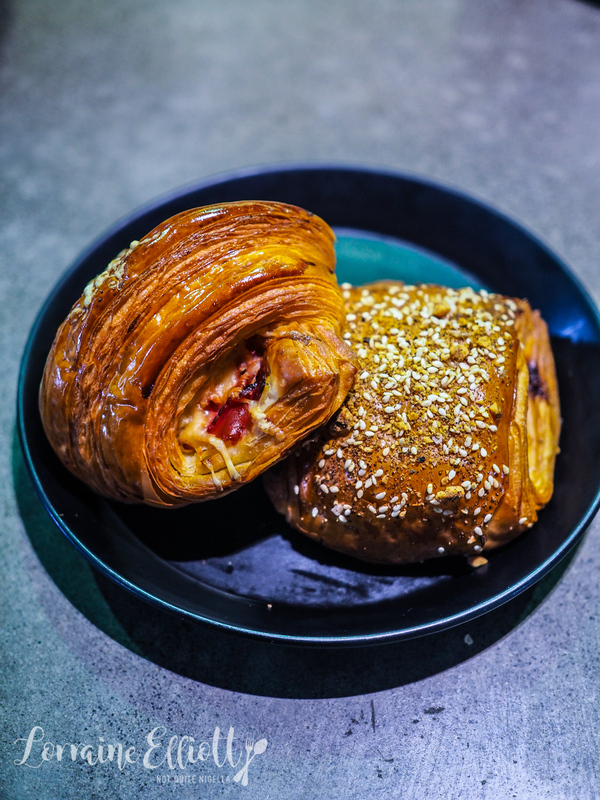 Dear Reader, I finally made the trip to Melbourne's Lune Croissanterie to try the much lauded and hyped croissants for myself. How do they stack up against the world's best? Is the two hour queue worth it? 18°C. That's the temperature that Kate Reid and her team work at. 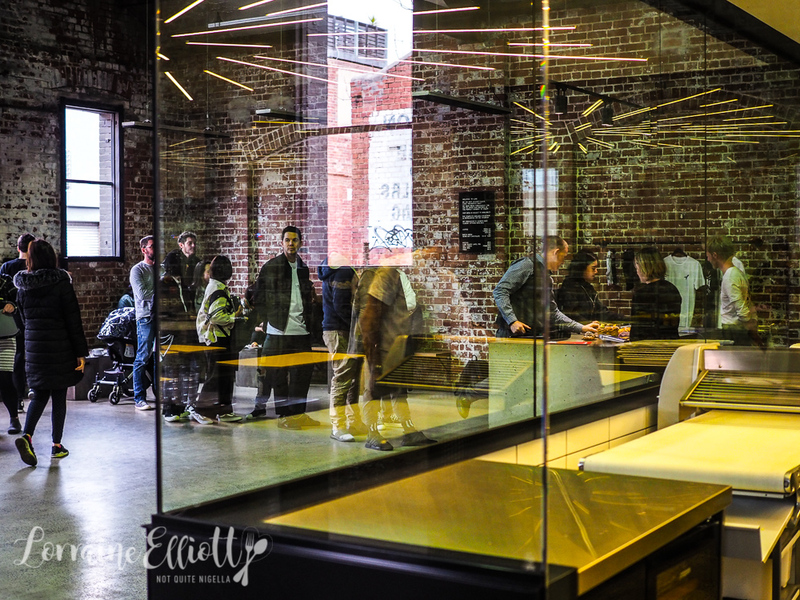 Working at this chilly temperature is one of the many things that form part of the complex and time consuming process of making what some say are among the best in Melbourne. 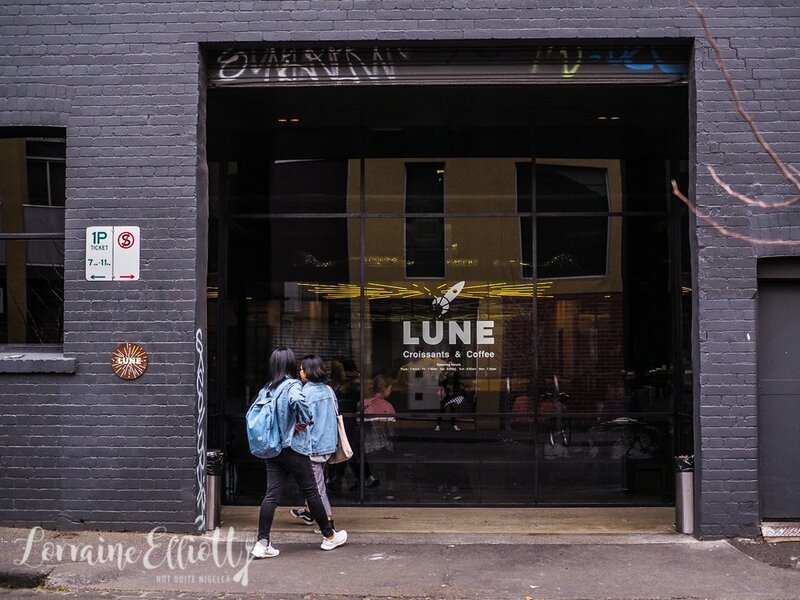 I'm here at Lune Croissanterie to eat pastry. After of course an early morning punishing training session that allows me to eat as much pastry as I want without compunction. And for a Thursday mid morning it is very busy with a lot of people doing their own photo shoots. So let's talk about the queue and cult of Lune. 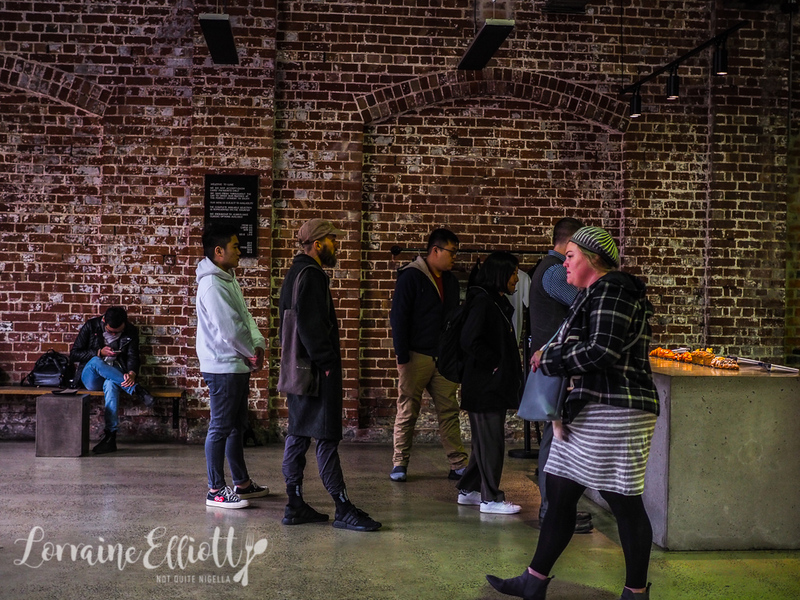 Because for me, queueing is to be avoided if possible (a friend once said to me "Queuing is for punks" and her quote has reverberated around in my head since). It is entirely possible to avoid the two hour queue that snakes all the way around the block. Just avoid weekends. Or if you don't want to eat in you can get a smartly boxed up selection from the takeaway window on Mondays and Tuesdays. I was under the impression that the pastries came warm out of the oven so decided to eat in. I ordered with the very patient and friendly staff who probably get sick of being asked the same questions but answer them as if they haven't said the identical thing to the previous customer. I sit down at the bar for a hotly contested bar seat. I was in luck as even on a Thursday morning it is packed with people and I only lucked out on that seat as I was by myself. It was just me, a hot chocolate (there's coffee and hot chocolate but no tea) and seven pastries. They deliver them all at once and this causes the two women sitting next to me to gasp. "Are you kidding me?" one says out loud laughing good naturedly. 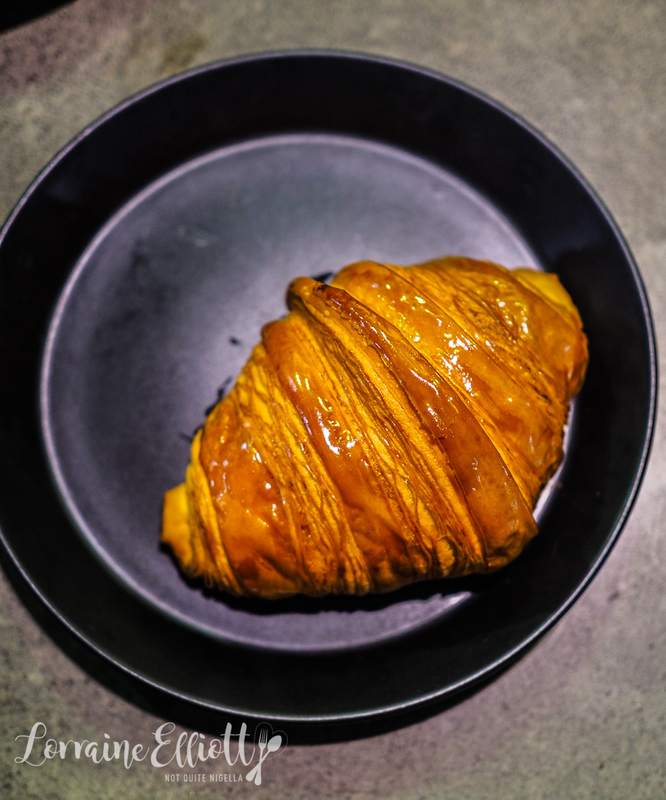 I start with the traditional shiny topped croissant. I cut it in half and it's got a good honeycomb pattern. The honeycomb pattern is not as exact as a Sadaharu Aoki one which I'm convinced is made in heaven as its internal structure is so perfect. It's light and lightly buttery. They uses two types of butter here: a Pepe Saya cultured butter and a French Beurre d'isigny. They tell me that the croissants are a three day process from beginning to end. 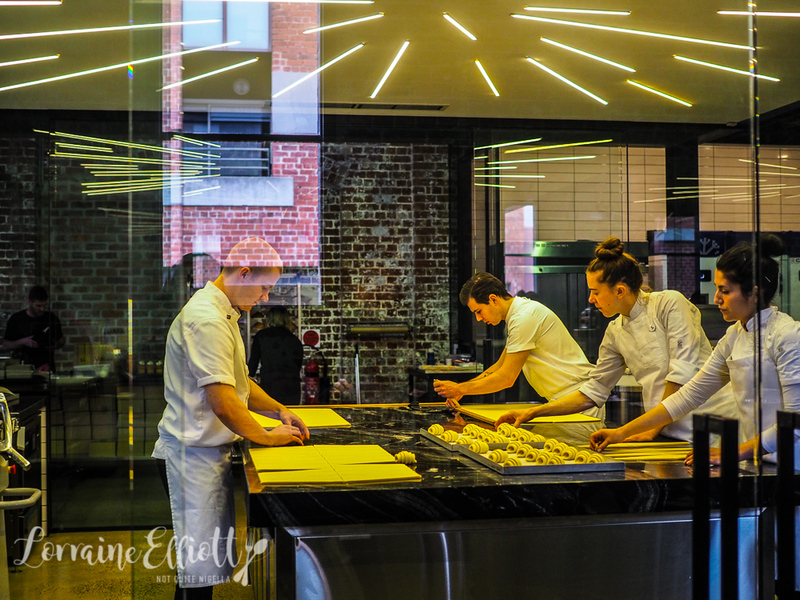 The bar is the best spot to watch the "NASA lab" in action with pastry chefs shaping croissants and laminating croissants dough-it's hypnotic. 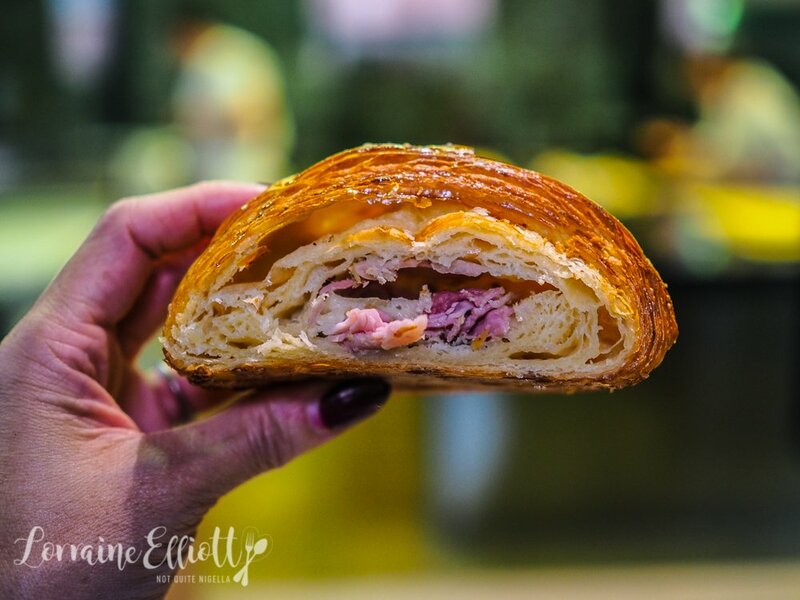 I start with the savouries-the ham and gruyere with seeded mustard has got a nice amount of filling in it and is more addictive the more bites you take. Suddenly, three quarters of it is gone and I just hope that Mr NQN has forgotten my promise to bring pastries home. 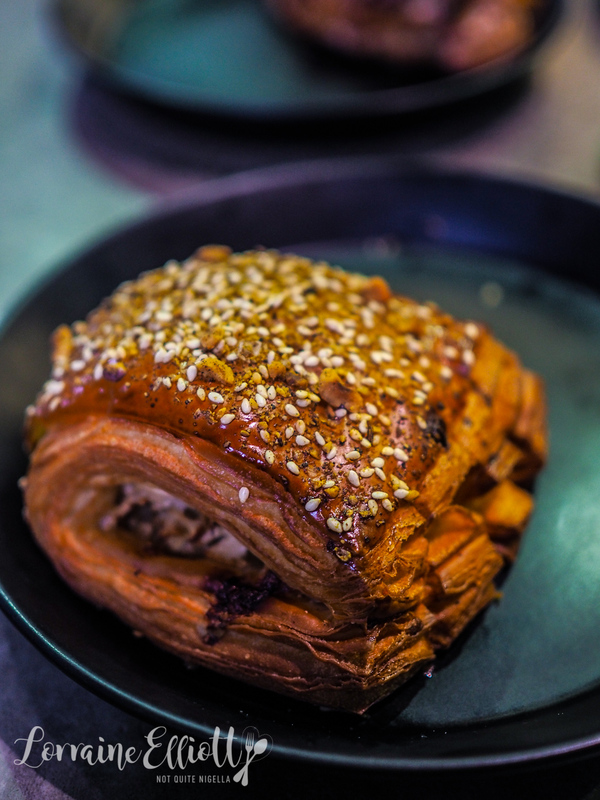 The cauliflower is a vegetarian friendly bear claw shaped pastry and comes filled with spiced cauliflower florets and thinly sliced pickled cauliflower florets and parmesan cheese. The top is dusted with a sesame dukkah-like spice mix for added flavour. It's $10 though and out of the two I prefer the ham and gruyere. 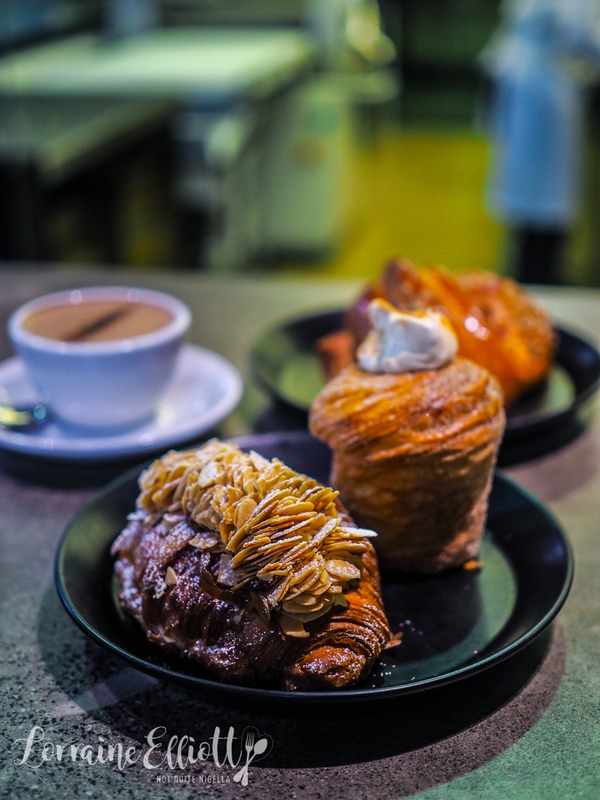 I delve into the sweet side next-the Kouign Amann is probably my favourite ever pastry. There's something about the butter, salt and caramelisation that makes this so utterly moreish. 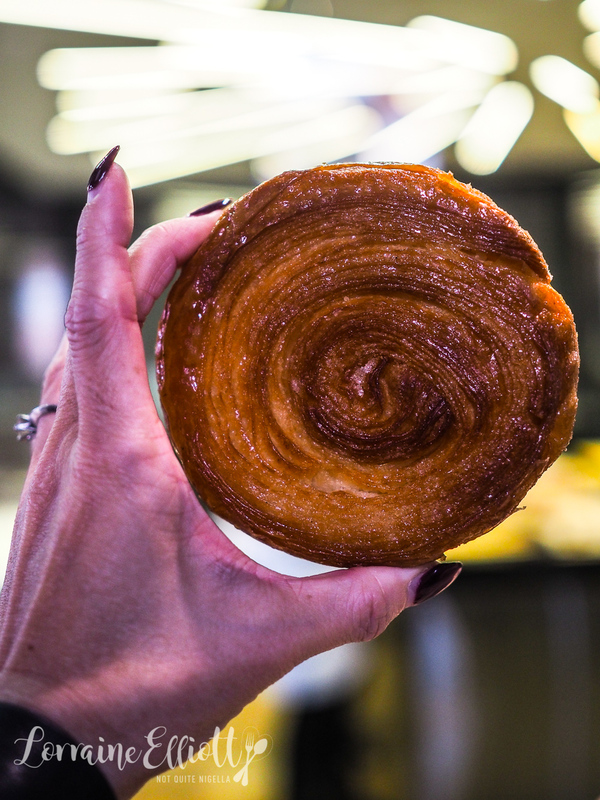 The kouign amann here is a modern interpretation and is shaped like a spiral or crispy laminated pastry. There isn't as much gooey caramel but it does deliver a nice crisp bite. Personally I love the caramel and the soft and crispness of a traditional one. 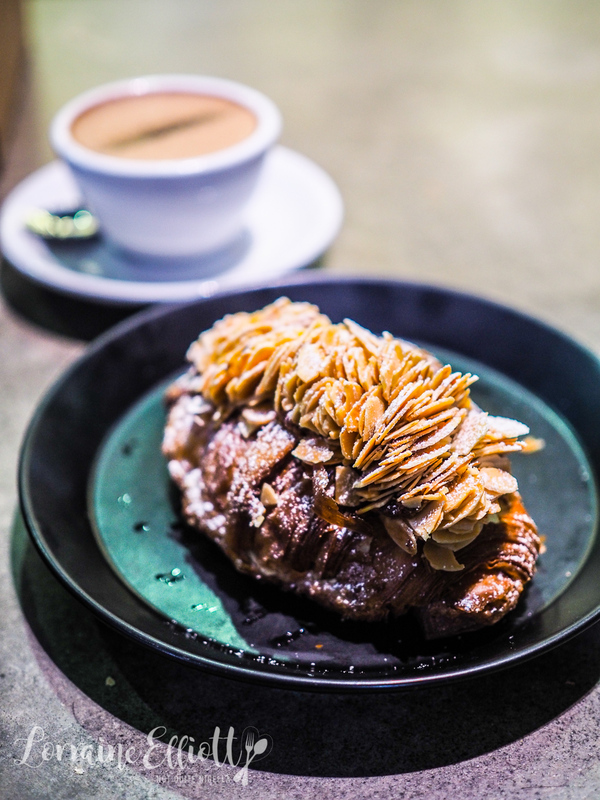 The twice baked almond croissant is a beautiful number with flaked almonds sitting upright on top hiding a lemony almond frangipane. I take a bite and then pack this up knowing that I will love this when warmed up at home in the oven. 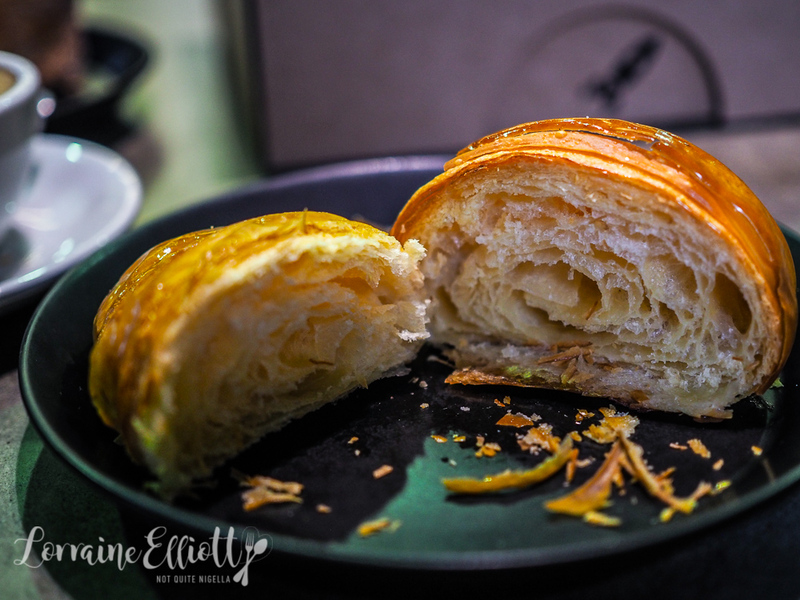 Interestingly they don't recommend reheating these and they say that the croissants are best eaten within 2-3 hours of baking. 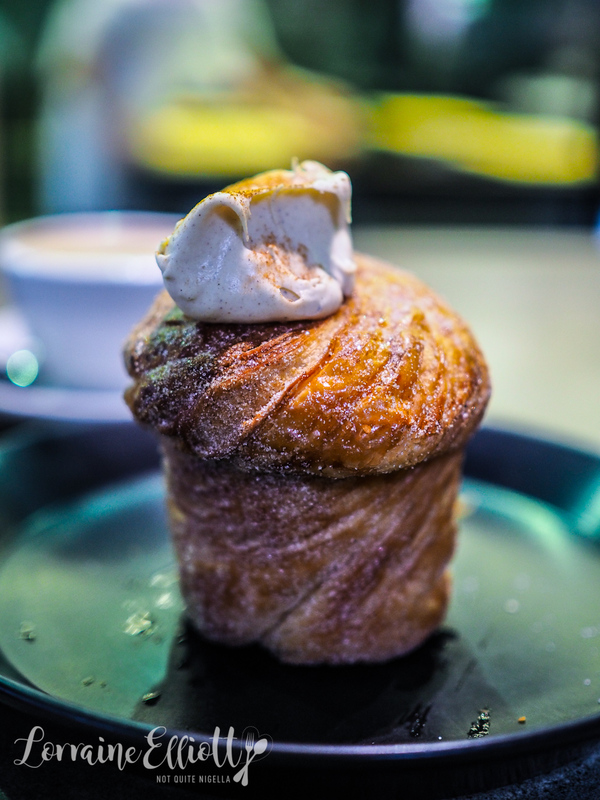 But to me, nothing beats warm pastry. 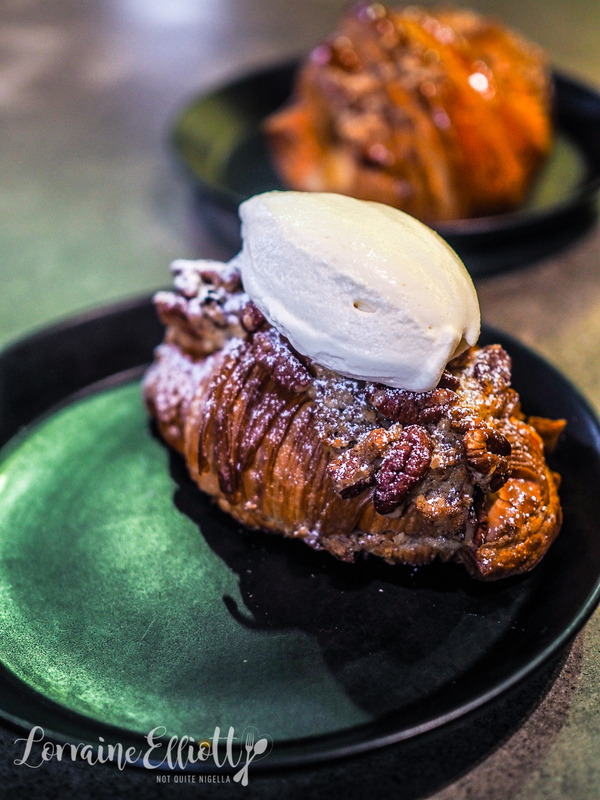 And while the almond croissant is the most popular sweet croissant, I preferred the pecan pie croissant. It's a bit extra for starters which always appeals to me and it has a pecan frangipane which I prefer to an almond one as pecans have a stronger, nuttier flavour. It's also sweeter as it has a smokey maple bourbon syrup and a very lightly sweetened maple bourbon cream on top. 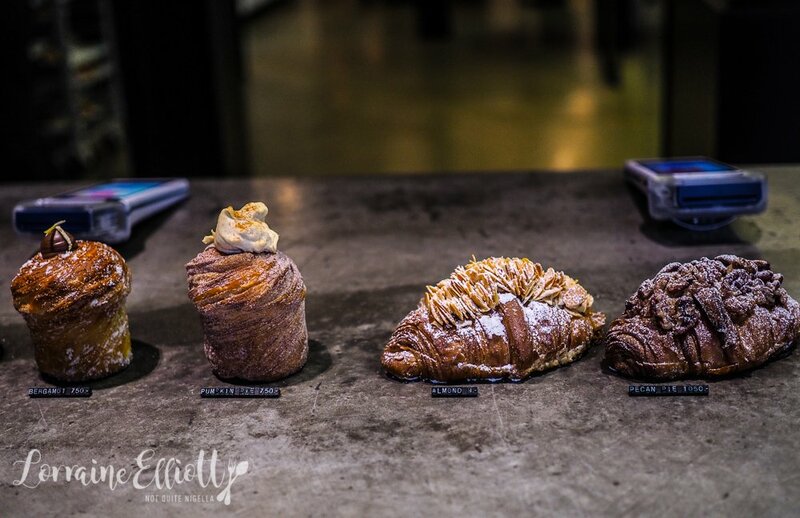 There are three cruffins on offer that day and the lemon curd is the most popular but I feel more in the mood for a pumpkin pie one. 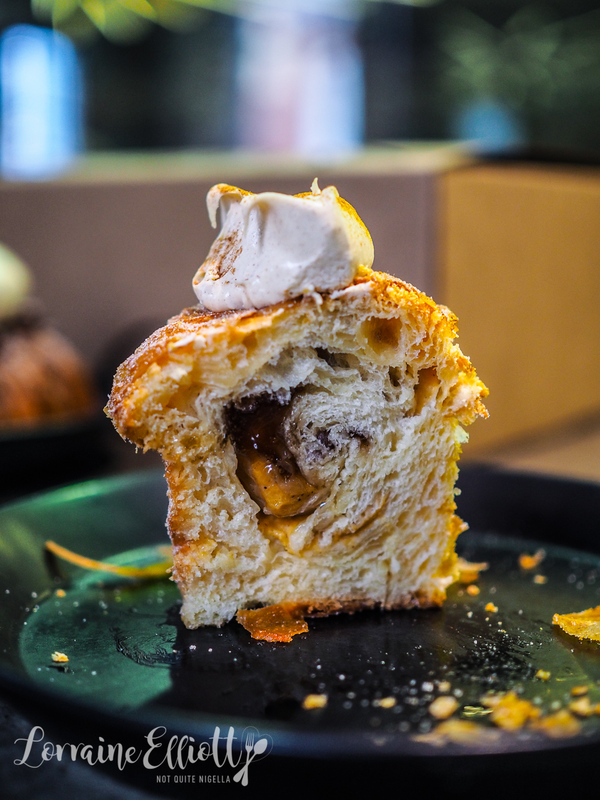 The cinnamon sugar rolled croissant muffin is filled with pumpkin pie mousse, a thick maple syrup and a dab of unsweetened cinnamon cream on top. The two ladies next to me that I have been talking to have departed and I look down at my black jeans. They are covered in buttery crumbs and sugar. I put what remains of the pastries into the box and pack up and leave. 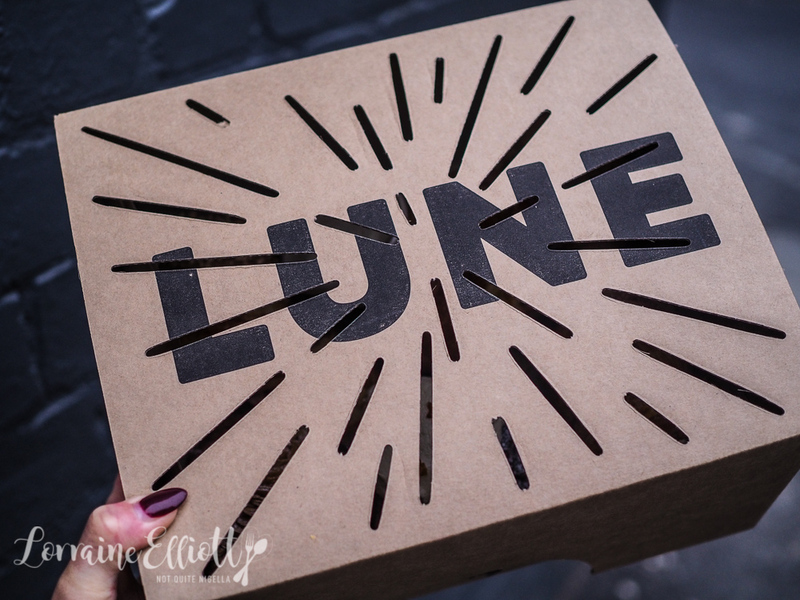 And when I catch an Uber the driver sees my box and just wants to talk Lune croissants. So tell me Dear Reader, how long would you queue for or do you feel like queuing is for punks? And what is your favourite type of pastry? 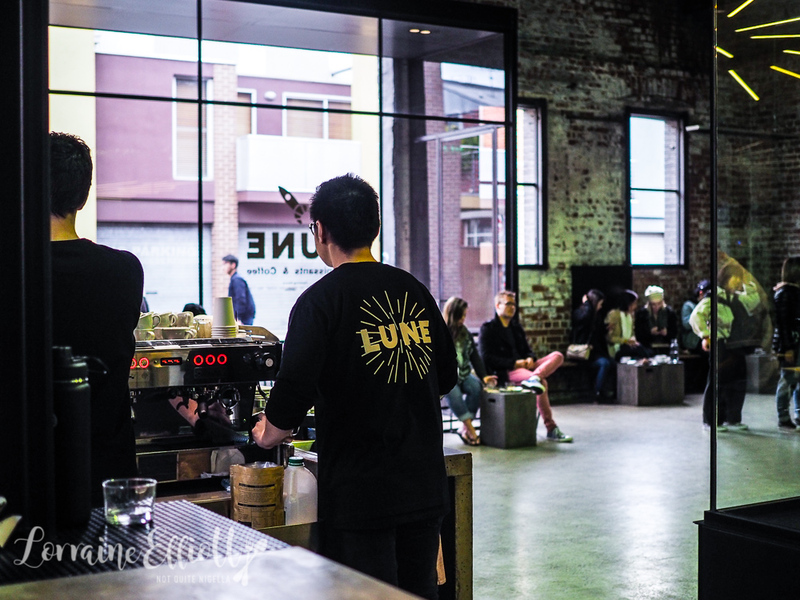 Have you tried a Lune croissant and what did you think?